Constructed in steel with 'the same technology and strength as a deep-sea tug', the new 26.6 metre explorer yacht from Italian yard Cantieri Navali Chioggia is a sturdy looking vessel, styled on a supply ship, which is designed to face any sea conditions with reassuring comfort and stability, and be easily managed by a small crew. The 230 ton Ocean King 88's structural strength will come from 12mm thick steel plates – made from RINA-certified Grade A FE 430 ship steel and welded on both sides - attached to frames only 50 centimetres apart. Commercial engines and very large fuel tank will give the yacht a long-range capability of 8,500 nautical miles at 8 knots. Its tug credentials include excellent manoeuvrability in difficult winds or currents thanks to Azimuth propellers 'ASD' (Azimuth Stern Drive). which are synchronised with the bow thruster by a Dynamic Positioning System, operated with a joystick, and a Bollard Pull of about 20 tons. With a beam of 8 metres the yacht offers plenty of interior volume – accommodation for eight guests is spread over three decks with the owner's cabin, a VIP and two guest cabins on the lower deck, the main saloon and dining area on the main deck, and an upper saloon on the bridge deck. Crew quarters for five are located forward on the main deck with a captain's cabin behind the bridge on the bridge deck. The 250 square metres of interior space is matched by a similar amount of exterior deck space, which includes a sun deck complete with spa pool and sunpad. Owners will be given considerable scope and choice when it comes to the interior design and fit-out, with a team of dedicated architects, interior designers and furniture makers on hand to guide and implement their vision. Twin MAN D 2842 LE 419 diesels, which are typically used for continuous commercial duty marine vessels, will give the Ocean King 88 a top speed of 12 knots and cruising speed of 10.5 knots. The Ocean King 88 is the middle size expedition yacht in a range which includes the 66 and 110. 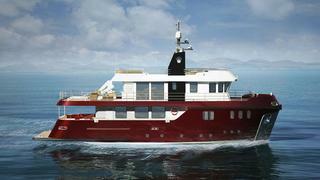 The yacht is due to launch in 2012, when it will be on show at Cannes and Genoa.